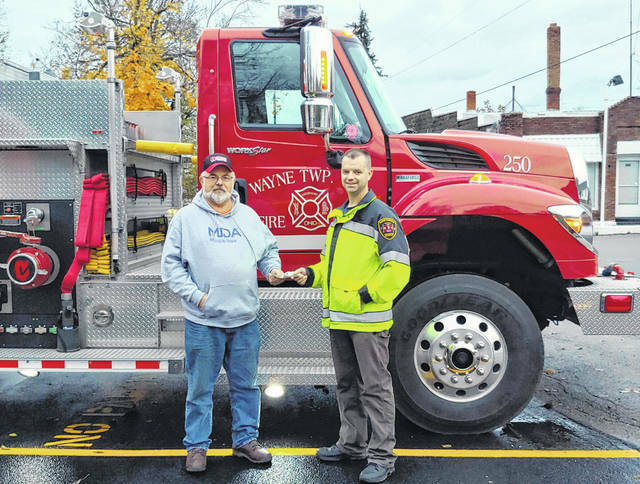 Wayne Township Fire and Rescue recently raised money for the Muscular Dystrophy Association with a Fill the Boot drive during their fish fry. Pictured is fire chief Chris Wysong handing Wayne Turner, Team X-Man leader and MDA supporter, a check for $107. Turner said he urges all fire departments to join in the Fill the Boot for MDA to find a cure. Anyone can contact Turner at (740) 606-9999 if they wish to donate. https://www.recordherald.com/wp-content/uploads/sites/27/2018/11/web1_received_316128999199759.jpgWayne Township Fire and Rescue recently raised money for the Muscular Dystrophy Association with a Fill the Boot drive during their fish fry. Pictured is fire chief Chris Wysong handing Wayne Turner, Team X-Man leader and MDA supporter, a check for $107. Turner said he urges all fire departments to join in the Fill the Boot for MDA to find a cure. Anyone can contact Turner at (740) 606-9999 if they wish to donate.